Our itinerary had us scheduled for an early Thursday morning departure from Ollantaytambo with the intention of staying the night in Aguas Calientes, a small tourist town at the base of Machu Picchu. Our tickets for Machu Picchu were for Friday, and we were planning on doing the 5:30am bus ride up to the ruins. Because of the Perurail strike our plans changed. We spent much of Thursday in line at the train station, due to rumors that the trains may run or that we could somehow get to Aguas Calientes that night. 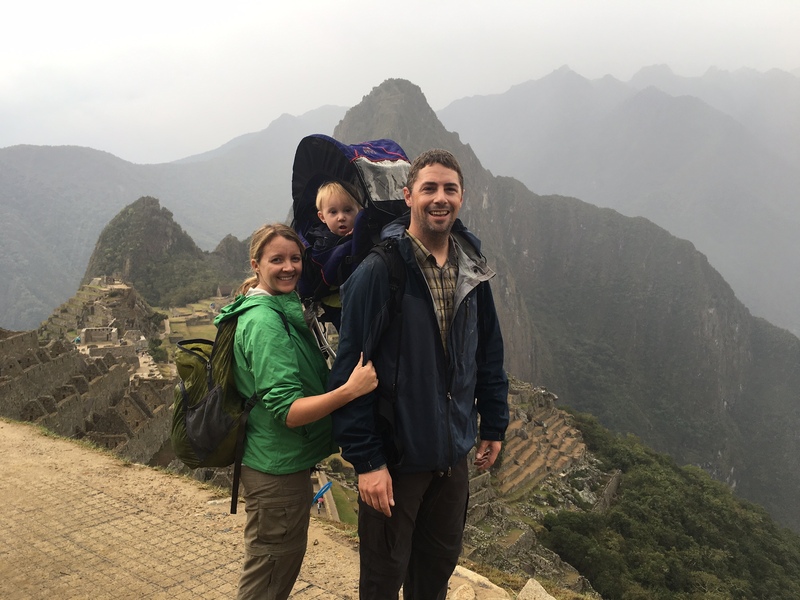 We even looked into hiring a taxi to take us as far as the hydrostation and then hiking 2-4 hours in, but eventually ruled that out, as we did not want to be hiking in the dark with the baby on our back. Everything worked out eventually. Turns out I forgot to actually book us a hostel in Aguas Calientes for Thursday night, so we weren’t out any money there. We were able to hop into a hostel close to the Ollantaytambo train station before the crowds hit. We were legitimately concerned that we would be without a place to sleep that night having been stranded in Ollantaytambo with so many others, including a school district field trip of about 60 ten year olds. We made the best of our extra night in Ollantaytambo, eating at our favorite spot one more time, Puka Rumi. Perurail put us on the first available train out of Ollantaytambo, but we were disappointed that it didn’t stop through our station until 10:30am, putting us in Aguas Calientes at noon. We were really hoping to still be able to get to Machu Picchu by early morning. Nothing we could do about it though so we picked up a boxed lunch from Hearts Café on our way out of town and loaded onto the train. The train provided plenty of food and we needn’t have purchased a box lunch. A lovely American couple, newly engaged, sat across from us. 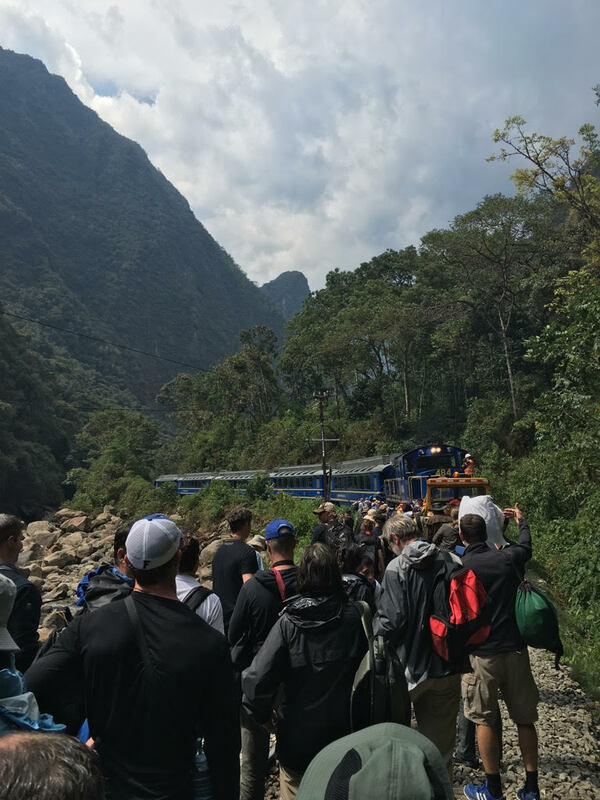 They had been re-scheduling their travel plans for three days and were cutting it close, barely getting to Machu Picchu…until the train in front of us was derailed! One of the InkaRail trains was derailed; luckily there were no injuries. This caused more than a two hour delay for us, but all in all it backed up the entire train system until 6pm that night! We eventually had to unload our train, walk around the derailed train and load onto another train that carried us into Aguas Calientes. When we finally arrived in Aguas Calientes at 2:30pm it was torrential downpour of rain! We fumbled around with our decision making, at first thinking we should gamble with our permit- hoping we could use it the next day and just grab a hostel in town to wait out the storm. Well, we couldn’t find a hostel available, and the weather forecast wasn’t much better for the next day. After wasting twenty minutes or so, we ran for the bus station, purchased our tickets and headed towards Machu Picchu. The scariest part of this entire adventure: the bus ride up the mountain! The rain had dwindled to a drizzle by the time we bought our bus tickets. It continued to drizzle a little as we hiked up, but at the moment we arrived to the look out the rain stopped, the clouds dispersed and it was as though angels were singing our welcome (specifically my grandma, since it would have been her 85th birthday this day!). It misted for another minute or two and then the rest of our time exploring Machu Picchu was sunny and clear! It was such a beautiful way to honor my grandma on her birthday and to experience one of the wonders of the world! After checking this off our bucket list we still had to wait out the train station delay. 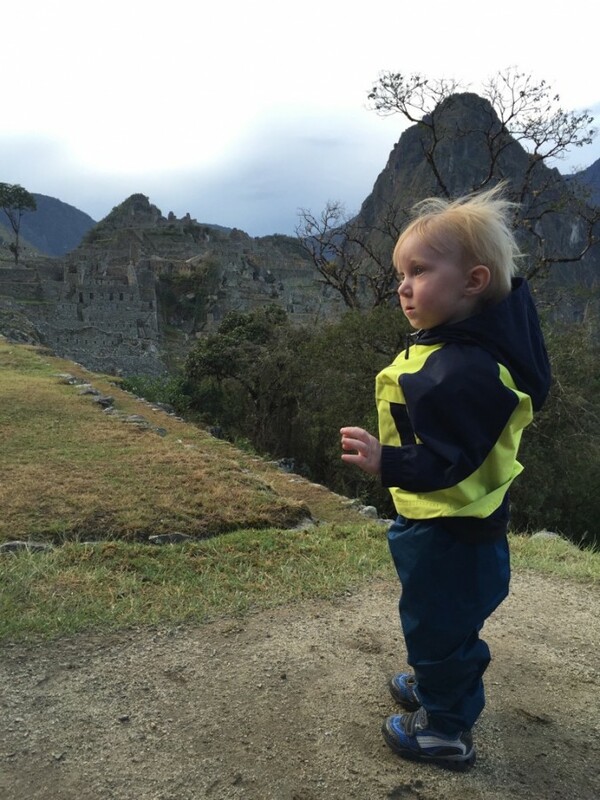 We took advantage of the extra time and explored little Aguas Calientes. We treated ourselves to beers and a fruit juice for Little Monkey at a cozy, posh little restaurant where we sat on a couch and toasted to our success. Wondering if the couple ever made it to Machu Picchu or not, because we knew for certain that three others had to cancel their trip, because of the rail strike. We were glad we made it, and also glad that we had scheduled Machu Picchu in the middle of our trip and not right at the end. When traveling, especially in a developing country, leave room for mishaps! I saved a lot of money by using the above site and getting my permit through the Peruvian government, even though many books and sites will say it’s not possible.